Can Yao Ming be a Future NBA Hall-of-Famer? With Scottie Pippen, Karl Malone and the 1992 Dream Team recently inducted in the Naismith Hall of Fame, it had me thinking about a certain former Rockets’ center from 90s, as well as some current NBA players. Someone like Hakeem was a surefire first ballot HOFer. He was a 2x champion,1x MVP, 2x Finals MVP, 12x All Star, 6x All-NBA first team, 3x All-NBA second team, 3x all-NBA third team, 5x All-Defensive first team, 4x All-Defensive second team, the all-time NBA leader in blocked shots, a member of the Dream Teams of the 90s and the 50 greatest players of all time, as well as one of the most dominant postseason performers in the history of the league. The first is called the HOF Monitor. It assigns a player a number based on certain criteria. It awards 75 points for every MVP, 15 points for every All-NBA first team selection, 1 point for each career point of Approximate Value (don’t even ask me how to calculate this one, I was a journalism major in college, not a math major), 2.5 points for career efficiency, 3.5 points for every NBA championship and a F/C penalty which takes away 15 points from forwards and 20 points from centers (which I like, as most statistics usually lean heavily towards bigs). While my head hurts even looking at this, and I miserably failed while trying to calculate a player’s value, there’s definitely something to this method. Looking at the top players for this stat, it’s like someone’s listed the greatest players of all time in order: Karrem, Jordan, Chamberlain, Russell, Magic, Bird, Malone, etc… (Hakeem is 14th). According to the web site, a score of 135 is a likely Hall-of-Famer. Looking at players who are not eligible for the hall or are still currently playing, there are 12 players who have a score of 135 or higher with guys like Reggie Miller (130), Paul Pierce (128), Dwayne Wade (125) and Ray Allen (12o) right on the cusp. Tell me that didn’t surprise you a little bit. Now you’ll get no argument from the top 10 out of me. Those guys are all guaranteed future hall guys in my book. Webber is certainly a “cusp” guy who may be remembered more for a single mistake in college than for his impressive NBA career, but McGrady was a bit of a shock (we’ll get to that later). I do have some issues with this statistic, however. To begin with, I have no clue what Approximated Value (AV) is, and I feel like I could have taken a class over an entire semester on it and still not understand it. Secondly, I don’t like All-NBA first team as a fair marker of a player’s talent (as only five players are awarded it every year, and some years has more talented players at a position than others), and I feel like championships could be given more value. Essentially it gives guys like McGrady (high scoring talent, was great for a short period of time, but no postseason success whatsoever) a serious advantage. The other statistic I found is Basketball Reference’s Hall of Fame Probability. This is is a formula based on who is “likely” to be in the Hall of Fame, which considers career points per game, rebounds per game, assists per game, All-Star selections, NBA Championships won and also detracts points for height (which I understand, but is still kind of ridiculous). Each criteria is given a certain weight, with championships receiving by far the most and All-Star selections also receiving a high amount, and then a player is given a probability out of 1.000. While I couldn’t explain this one either, I at least like the fact that it places more emphasis on postseason play, uses All-Star selections instead of All-NBA first-teams and uses the stats we all know and love (though I’m beginning to appreciate PER more and more every season, and can see the advantage to it, as well). The only major problems I see when looking at that list of players is that point guards are valued considerably less than other positions (as assists aren’t weighted as highly as points or rebounds). I’m not the only one who probably thinks Billups and Nash have a better chance at the Hall of Fame right now than Melo and Bosh. Also, it doesn’t really take efficiency into account, which helps players like McGrady and Melo, who aren’t exactly efficient shooters. 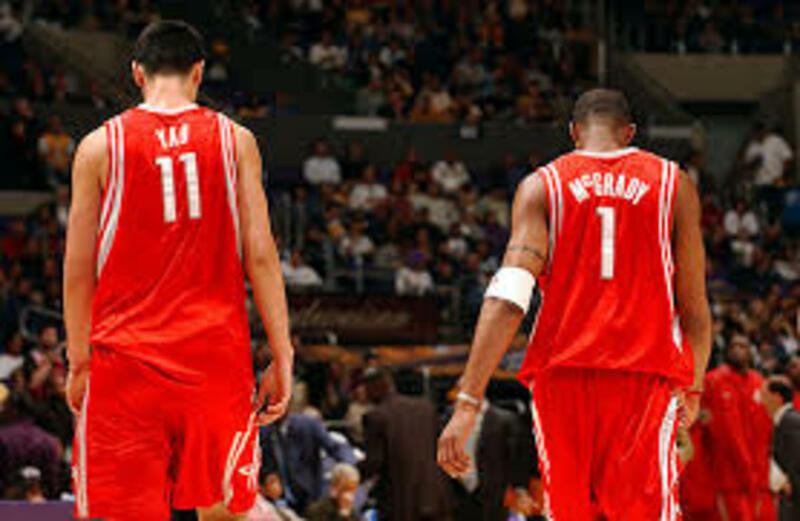 So looking at T-Mac and Yao, what are their chances of making the Hall of Fame someday? From 2000-2008, there’s no denying McGrady’s offensive dominance. Eight straight seasons of 20+ points, 4.5+ assists and 5+ rebounds per game is pretty impressive, even if he has been a miserable defender. He’s a 7x All Star, 2x scoring champion, 2x All-NBA first team, 3x All-NBA second team and 2x All-NBA third team. However, all that being said, I think he’s a significant tier below other wings of his generation. Guys like Iverson, Kobe, Pierce, Wade and Lebron will all make much better cases. And the thing that really hurts him is his complete lack of post season success. Not a single playoff series victory has got to hurt his chances, as does his inability to carry bad teams (which Kobe, Lebron, Wade and Iverson can all say they’ve done). His court vision was incredible, he was one of the best scorers of the last decade, but I don’t know that that’s enough to get him into the Hall. If he retired today, I don’t think he makes the Hall of Fame, despite what the statistics say. If he could alter his game to be a 6th man type or a savvy veteran on a winning team, that would really help his case in my opinion. He could eventually get in the hall in a weaker year, but he certainly isn’t a first ballot guy, and the lack of a college career certainly doesn’t help his cause. Verdict: Borderline, needs a little help. Four straight seasons of roughly 20, 10 and 2 certainly helps, as does his impressive shooting percentages. He is also a 7x all star, a 2x All-NBA second team, a 3x All-NBA third team and was a member of the 2003 All-Rookie first team. He benefits from the fact that there were fewer elite bigs in his generation than T-Mac, but I doubt he’ll ever make an All-NBA first team because his career was sandwiched between two future first ballot hall of famers, Shaq and Dwight. He has a similar lack of post season success to Tracy, but what hurts him most right now is his short NBA career. Seven seasons isn’t enough to make the hall usually unless you’re incredible during that time. Yao has more career points, with similar rebound and block stats to Hall of Famer Bill Walton, but Walton also has an MVP, two NBA championships and a Finals MVP, as well a stellar college career with 3 Naismith College Player of the Year awards. Yao can’t touch Walton’s post season success or college success, however he can help his case with his overseas career and as the player which helped market the NBA to China. At only 29, if he can come back from the injury and post similar stats over the next three or four seasons with one or two deep post season runs, then I think his chances are much better than McGrady’s. As it stands now, no way, but with a few more solid seasons and his overseas success, I think he’s got a really good shot. Verdict: No chance right now, but a few more decent seasons and he’s there. NBA Analysis: Is Rockets Yao Ming's Career Over? What Will Rockets Yao Ming's Legacy Be? How Will Yao Ming Impact the Rockets in 2010-11?